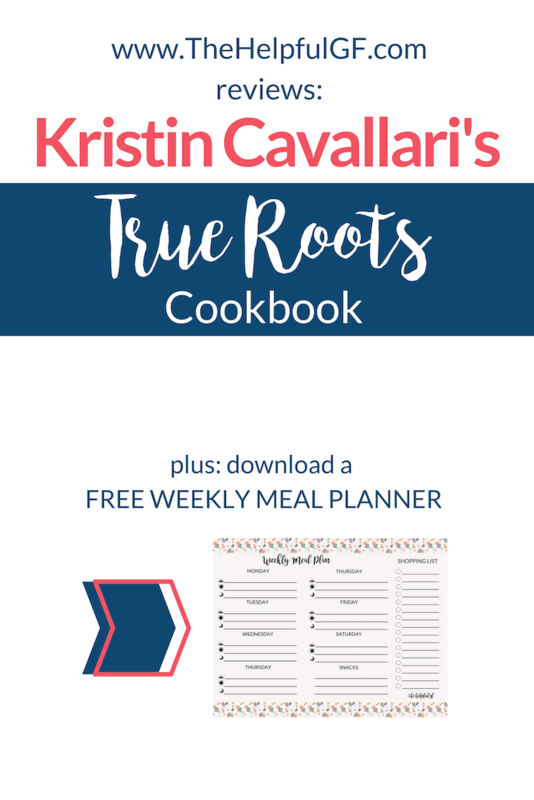 The True Roots Cookbook is a collection of over 100 gluten-free, dairy-free, refined sugar-free recipes created by Celebrity Kristin Cavallari with chef Mike Kubiesa. Cavallari begins the book with a quick synopsis of her own healthy eating journey and how she balances healthy cooking with her family. While True Roots cookbook does claim to be gluten-free, dairy-free, and refined sugar-free, it is worth noting that she often uses oats as an ingredient. If Celiac, be sure to use purity protocol gluten-free oats instead of mechanically sorted oats due to the increased risk of contamination. She also uses sheep milk yogurt and cheese in recipes as well as paleo sweeteners like coconut sugar and maple syrup. 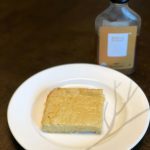 I tried out 6 of her recipes and had great success—keep on reading to see what I made! 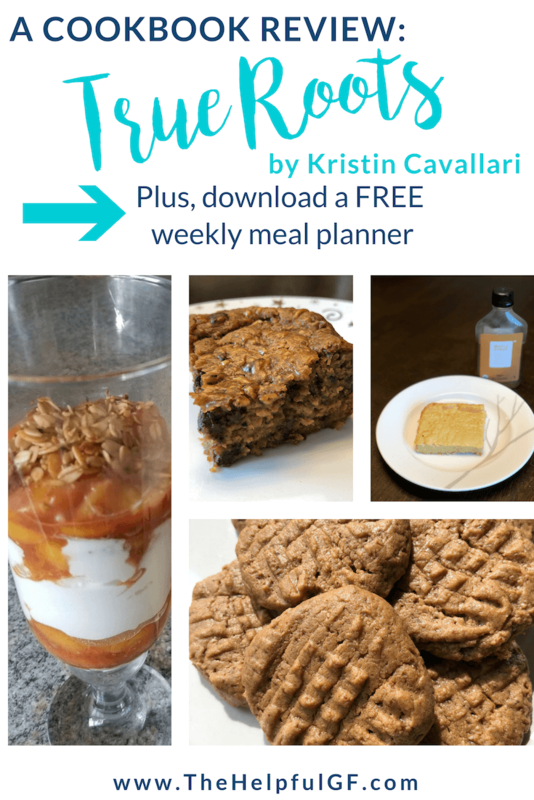 You can also get instant access to the FREE weekly menu planner & shopping list here! The recipes in the True Roots cookbook range from breakfast & kitchen staples (like almond milk), to desserts & treats. They even range from simple (seasoned salt) to fancy (veal braciola with cashew ricotta). With this range of recipes, you are sure to find a recipe for almost any occasion! Also, my kids tried each of the recipes we made and LOVED them—so most of the recipes in the True Roots cookbook are family-friendly! special note on ingredients: many of the specialty ingredients used in the recipes below can be ordered online. The links below will take you to Amazon, but many ingredients like maple syrup, coconut sugar, and coconut oil can be found for only $3 each at Brandless. Click here to save $6 on your first Brandless order! Another great place to find specialty ingredients is Thrive Market. Click here to read my full review of Thrive Market and get a coupon code for a huge discount. According to the True Roots cookbook, this recipe serves 4 and takes 15 minutes. To make this recipe you’ll use: coconut oil, berries, almond milk, oats (be sure to use purity protocol like these), egg, vanilla extract (make sure it’s gluten-free like this brand! ), maple syrup, and ground flaxseeds. For kitchen tools you’ll need and an oven-safe pan. Not only is this recipe super easy, but it is a great make-ahead recipe. I made a batch of this recipe and divided it into Pyrex containers to use for quick breakfasts! The True Roots cookbook states that this recipe serves 4 and cooks for 15 minutes. 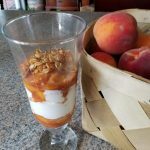 This recipe takes sheep’s milk yogurt (or you could use coconut milk yogurt if you need it truly dairy free), pure maple syrup, coconut oil, peaches, cinnamon, vanilla extract, and granola. You’ll need a sauté pan for caramelizing the peaches. We actually topped this with the recipe for Simple But Damn Good Granola also in the True Roots cookbook. 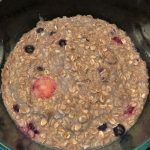 This recipe is so simple as well and uses oats (again, use purity protocol if sensitive! ), almonds, cinnamon, honey, and hemp seeds. It bakes in the oven, so you’ll need a cookie sheet. These recipes were super easy as well and made a fun, healthy treat! Even my husband who isn’t a big fan of peaches really enjoyed them caramelized. While this recipe is in the breakfast section of the True Roots cookbook, we ate it as dessert. yum! A “Dutch Baby” is a kind of baked pancake. This recipe will serve 4 and takes about 25 minutes. 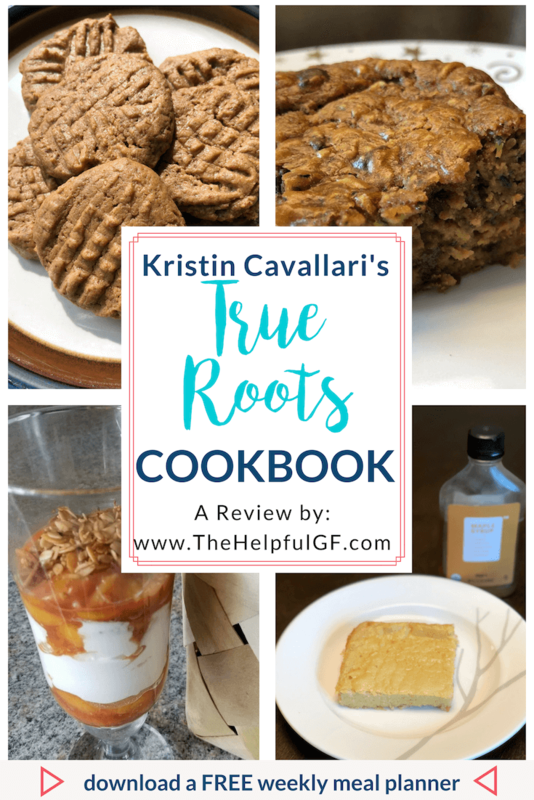 This True Roots cookbook recipe will need coconut oil, almond milk, arrowroot powder, oat flour (again, be sure use purity protocol oat flour), lemon zest, eggs, Himalayan salt, maple syrup, and vanilla extract. For kitchen tools you’ll need a high-powered blender like this one and a Dutch oven. Honestly, this is probably the easiest recipe out of the bunch. So easy in fact, that I might not make traditional pancakes on a griddle until my kids are old enough to flip them—haha. However, it was not only easy, but yummy. We topped ours with maple syrup (as pictured) but this would be great with berries as well! Moving on from breakfast, this True Roots cookbook main dish will serve 4 and need to cook for 45 minutes. 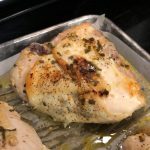 You’ll need olive oil, fresh sage, garlic, chicken breasts, and salt & pepper. You’ll need a baking dish and parchment paper for the cooking. This recipe was just simple perfection. Sometimes you really don’t need fancy—just plain old good food. This is the first recipe I made from the True Roots cookbook. And it left me wanting to make more! This makes about 16 blondies (depending on how big you cut them!) and will take 30 minutes. 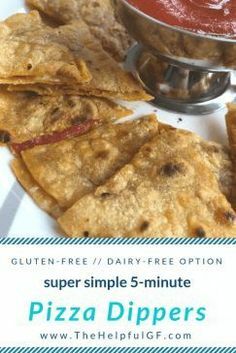 To make this recipe, you’ll need creamy almond butter, eggs, Himalayan salt, baking soda, coconut sugar, vanilla extract, dark chocolate chips (I used Lily’s but Enjoy Life’s chocolate chips are yummy too! ), and zucchini. You’ll need an 8×8 baking dish, but I also used this Kitchen Aid grater attachment to grate the zucchini quickly and easily! 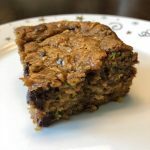 This was a delicious recipe, the only drawback is that it doesn’t really tell you how much zucchini to use—it just says “large” so it left me guessing. Mine turned out okay though, and I’d estimate I used about 1.5 cups. 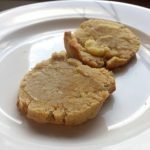 This recipe makes a TON of cookies (30+) with a short cook time of 10 minutes and only 6 ingredients: cashew butter, coconut sugar, eggs, vanilla extract, baking soda, and Himalayan salt. You’ll need a baking sheet and parchment paper because this dough is sticky. But it cooks up really well! You’ll also need a cooling rack. 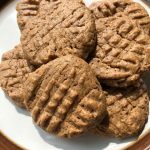 These cookies were similar in texture and consistency to peanut butter cookies—but the flavor is more mild and subtle. The True Roots cookbook is great! I was honestly surprised that many of the recipes were not only family-friendly, but actually tasted good! 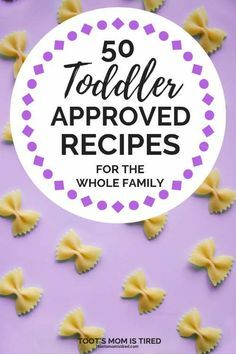 I know I reviewed 6 of the recipes here, but I have a list of many more to try—like pudding pops, golden milk, kids’ favorite fritters, and blueberry cashew bars just to name a few. It would’ve been nice to have more pictures of the recipes—but honestly, that’s just me being picky. 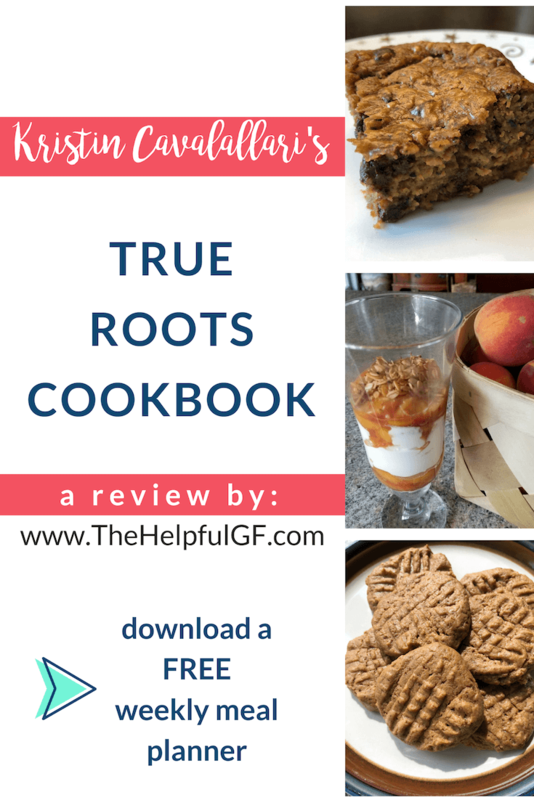 If you are looking for a diverse, family-friendly cookbook filled with gluten-free and dairy-free recipes that are low in sugar, I really do encourage you to try out the True Roots cookbook. Have you tried any of these recipes? Let us know in the comments below what you thought and be sure to pin this review on Pinterest so you can find it later! 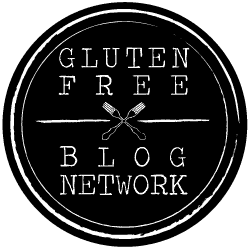 If you are looking for another gluten-free, dairy-free cookbook? 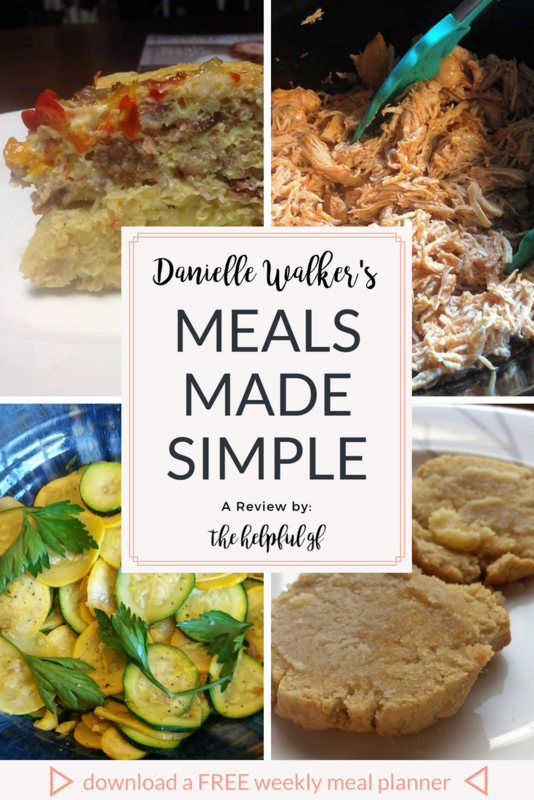 If so, read my review of Danielle Walker’s Meals Made Simple here. 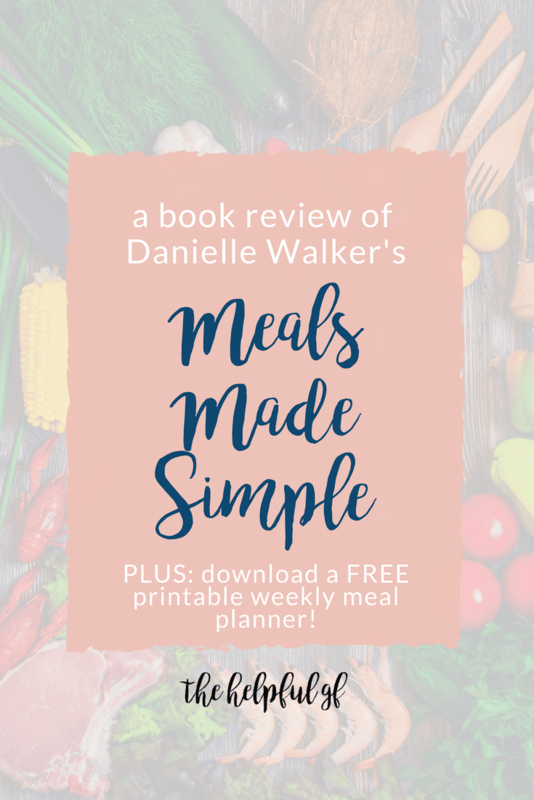 Don’t forget–download my FREE printable menu planner and add these awesome gluten-free meals to the list! 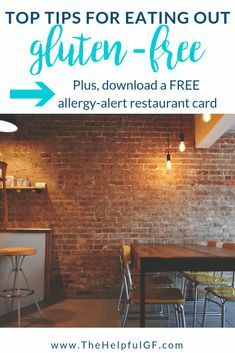 You’ll also get FREE instant access to my online library of free printables designed to make your gluten-free lifestyle totally easy! This post contains affiliate links. These links help me to earn enough money to refill my coffee so I can keep up with life! My full disclosure isn’t that interesting, but you can find it here. Danielle Walker, founder of Against All Grain and author of this cookbook Meals Made Simple, is an author I’ve followed for a LONG time. When Tyler and I first got married, I found her blog so inspiring. 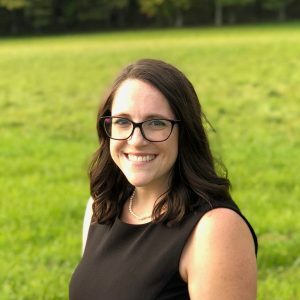 I admire her transparency with her readers covering her ongoing journey with autoimmune disease and its effect on daily living. However, I totally respect her ability to use food (specifically, a Paleo diet) to heal many aspects of autoimmunity. 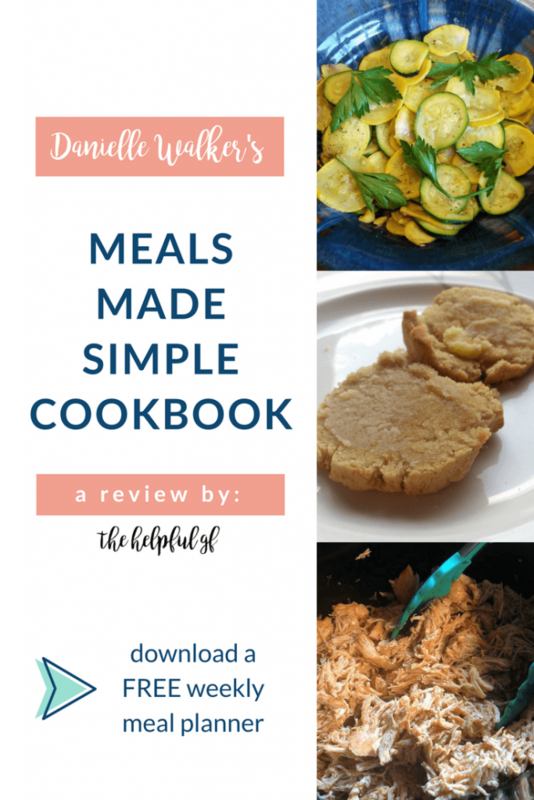 While my family hasn’t totally made the transition to Paleo (I’d estimate we’re about 80/20), we’ve been trying out Walker’s second cookbook, Meals Made Simple, for about a month. Keep on reading to learn more about it and discover if it’d be a good fit to add to your cookbook library. Click here to take a peek at everything else I’m reading this summer! While Meals Made Simple includes over 100 recipes, it is a bit more than just a cookbook. Walker becomes your guide to a transition to the Paleo diet. She begins with a summary of her personal journey of transitioning to Paleo and her experience helping others. She then shifts to become your guide in the kitchen—an introduction on how to use Meals Made Simple, a shopping guide (including a synopsis on ingredients you will use, quality of ingredients, essential kitchen tools, and more), and a simple guide to Paleo. For her readers, Walker defines the Paleo diet as “reverting to the foods that our bodies were intended to consume and process before the days of the agricultural revolution and processed foods” (p. 34). 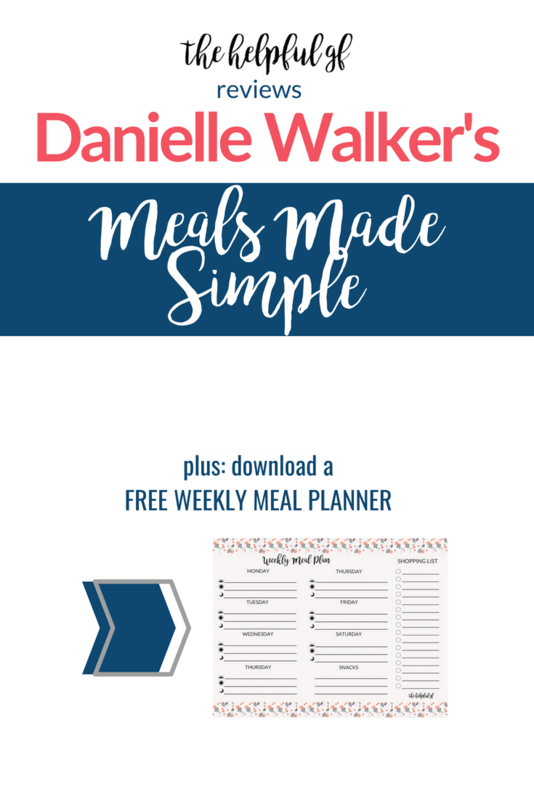 Finally, Meals Made Simple concludes with 8 weekly meal plans complete with shopping lists. This makes your planning easy–she does it for you! 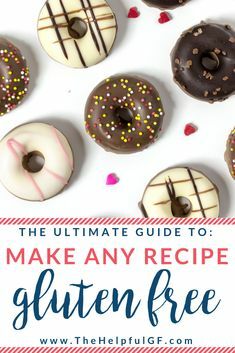 All recipes in Meals Made Simple are Paleo—meaning that they are gluten-free (and dairy-free) by default (this also makes many of her recipes fitting for AIP and other diets). Walker claims that these recipes are designed for busy-living. Many recipes are crockpot meals or even 30-minute recipes. 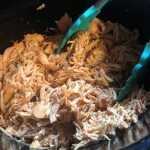 Personally, I rely on my slow cooker a lot, so that’s a major reason why I decided to finally give Meals Made Simple a try. Meals Made Simple divides its recipes into the following categories: breakfast, soups & hearty salads, poultry, beef/pork/lamb, seafood, sides, basics, and simply sweets. I tried out recipes for you—(you may have seen a couple teases of me making them in my Instagram Stories—if you don’t follow me yet, click here and do it!). Here’s what I tried and what we thought! Yummy crumbly biscuits topped with ghee! According to Meals Made Simple, this recipe makes 8 biscuits, takes 20 minutes of prep, and cooks for 18-20 minutes. To make these, you’ll need blanched almond flour, coconut flour, eggs, honey, almond milk, apple cider vinegar, baking soda, salt, and either palm shortening or ghee (I used Thrive Market brand’s ghee—learn more about why I like Thrive Market here). You’ll also need parchment paper, a flour sifter, baking sheet, either a mixer with a dough hook or a pastry cutter (I used my Kitchen Aid’s dough hook), a biscuit cutter (I just used my hands), and a wire cooling rack. This recipe was easy outside of one issue: you had to sift a LOT of flour, and it felt like it took forever (and it made my hands tired—I know, wah wah). I do think the sifting was necessary though because these biscuits–DANG they were good. The texture was great, but the taste was even better. We ate them warm with some ghee on top and the kids added jelly. I do feel as if the result was worth the work and I’ll probably make these biscuits again, I just know that I wouldn’t have the gusto to make this recipe on a regular basis due to all the sifting. I’m a wimp, obviously. 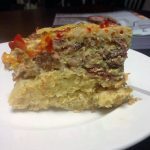 Overnight Breakfast Casserole–right out of the crock pot! According to Meals Made Simple, this recipe serves 6-8, takes 20 minutes of prep, and cooks for 6-8 hours in the crock pot. To make this breakfast casserole, you’ll use palm shortening or softened ghee (I used Thrive Market’s ghee), breakfast sausage, bacon, onion, white sweet potatoes, bell peppers, eggs, almond milk, full-fat coconut milk, salt, dry mustard, and black pepper. For kitchen tools you’ll need a slow cooker, a skillet (for precooking the sausage and bacon), a grater (I used my Kitchen Aid shredder attachment), a sharp knife for chopping, a whisk, and a bowl. This recipe was so delicious, and pretty simple (CROCK POT). We actually made it for dinner (which I think was a good choice, since we actually stopped our crock pot early. At only 5 hours of cooking the edges of the casserole were already a bit brown, and we sleep for more than 5 hours at night…). We had quite a bit of leftovers too. Tyler has actually asked me a couple time to make this again! It’s on my list for a repeat next week. Slow Cooker Buffalo Chicken–shredded, spicy goodness! According to Meals Made Simple, this is a slow cooker recipe serving 6-8, takes 20 minutes of prep, and cooks for 4 hours. To make the crock pot buffalo chicken you’ll need boneless skinless chicken breasts, Buffalo sauce, ghee, white vinegar, salt, and cayenne pepper. To turn it into a salad you’ll also need romaine lettuce, celery, shredded carrot, and ranch dressing (Walker includes a recipe for Herb Ranch Dressing that we didn’t try—we used Primal Ranch which is our FAVORITE. You can find it cheaper at some local stores or through Thrive Market). You’ll also need a slow cooker. I absolutely loved the simplicity of this recipe…almost as much as I love Buffalo anything! It honestly took much less than 20 minutes of prep. To make things even simpler, I filled a couple gallon-sized freezer bags with the ingredients and tossed them into our chest freezer. Now I have meals prepped for weeks when I just can’t get meal planning together! While I ate it as a chicken salad, Tyler ate it as a wrap using a burrito sized gluten-free tortilla. Both ways it was great! One note: it was VERY spicy. Next time I’ll probably leave out the cayenne pepper. This is a super yummy and SIMPLE paleo side dish! According to Meals Made Simple, this recipe serves 6-8, prep time is only 10 minutes, and the cook time is 15 minutes. 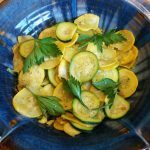 This recipe calls for ghee or olive oil (I used olive oil), garlic, zucchini, yellow squash, ground cumin, sea salt, and black pepper. You’ll also need a knife & cutting board, and a skillet. This recipe was simple perfection. It was one of those recipes that reminds you that regular food right from the earth is delicious. I’d never had cumin as a seasoning straight up on veggies, and I liked it! It wasn’t anything earth shattering, but a good, reliable way to eat your veggies. My overall rating of the cookbook is a 4/5. I really liked the recipes I tried, and there’s more that I still want to try! Not all the recipes fit my idea of ‘simple’—but I think a quote from the book itself sums it up perfectly: “This way of cooking takes a bit of extra prep work but is, in the end, a lifesaver.” (p. 13). It does take extra prep to eat healthy, whole foods. But it does improve your health—and that is worth it. If you are curious about the Paleo diet (or just looking for more gluten-free recipes), click on over to Amazon to “peek inside” Meals Made Simple and some of Danielle Walker’s other cookbooks (she even has a new one coming out in December, Eat What You Love, which is a whole cookbook of Paleo comfort foods–now that is right up my alley. You can actually preorder it on Amazon, Christmas gift maybe?)! I know I personally will remake the Overnight Breakfast Casserole and Buffalo Chicken Salad. I mean, it’s two more crock pot recipes in my arsenal. But I’ll also continue trying new recipes from Meals Made Simple. Have you tried any of Walker’s recipes? Let us know in the comments below.